I used to buy this bread when I lived in Galway, down at the little corner shop, round the bend from my flat. 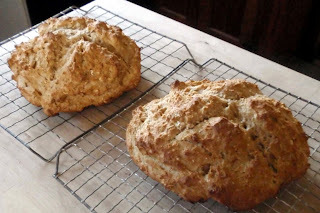 It was baked fresh daily and was one of the simple joys of living in Ireland. 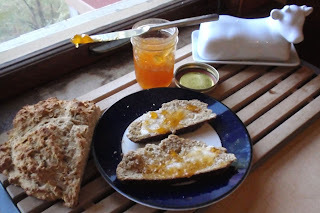 It was my breakfast most days, slathered with delicious Irish butter and some sort of jam, served up with a cuppa tea. So perfect. Happily, I met Colleen who was able to teach me how to make this bread for myself--and here I am 12 years later still baking this bread as a regular part of weekend breakfasts--especially when I have some leftover buttermilk that needs to be used up. I would describe it as being a cross between a hearty whole grain bread and a biscuit. And one its best features is how damn easy it is to make. Really--you can whip it up in less than 15 minutes and then just sit back and enjoy your first cup of tea while you wait for it to bake. Preheat the oven to 400 degrees. Grease a cookie sheet (or cast iron kettle with a lid). Mix together all the dry ingredients. With a fork, stir in the buttermilk and butter. Knead the bread in a bowl until mixed and relatively smooth--if the dough is too dry, add a little more buttermilk. Divide dough into two equal sized balls. Place them on the cookie sheet, smoosh the ball slightly with the flat of your hand, then cut a cross-hatch in the top of each (to allow the bread to expand as it bakes). Bake for 30-35 minutes. Once done, the Irish like to brush the top wiht a bit of milk and wrap the loaf in a teatowel to store it--of course this assumes you will eat it all in 2-3 days (which is not hard to do due to its yumminess and relatively modest size). I usually freeze one of the two loaves for instant brown bread at a later date. Do enjoy it with some fantastic jam and european style butter if you can find any. I am partial to apricot or bumbleberry jams.